We construct experiments to examine a variety of biophysical topics, exploring systems in which the complex interactions between individual components, such as biomolecules or cells, can give rise to, or be described by, simple and robust physical patterns. Our projects fall under two main umbrellas: biophysics of the gut microbiome and membrane biophysics. To explore these themes, we develop new optical and computational tools. Some glimpses of our research projects are given below. How do cells organize themselves into complex tissues and organs in a developing animal? How are geometry, mechanics, and signaling connected to give rise to robust, functional forms? Most of of our work on this theme focuses on the gut microbiome. You, like all animals, are not a single species. Each of us is host to tens of trillions of microbes, mostly resident in the intestines, whose profound importance to health, disease, and development is just beginning to be understood. (See here for a popular article on this.) Conventional methods, based mainly on DNA sequencing, yield important information about the compositions of these commensal microbial communities (i.e. what species are present), but provide little or no insight into their structure and dynamics -- things that must be important for the functioning of a multispecies ecosystem. How do bacterial colonies nucleate and grow? (Can we apply to them our understanding of growth modes of snowflakes, soot particles, and other non-living systems?) How (and why) do bacteria swim in a complex environment? How do different groups compete? What does "equilibrium" look like in a complex system of active, strongly interacting agents? Our approach to these questions involves directly visualizing gut microbial communities in living organisms. For this we need new sorts of microscopes for three-dimensional imaging, and a good model system to look at. ... about light sheet microscopy applied to microbial systems, see this review paper of ours (2018). ... about what we can learn about the structure and growth of bacterial colonies, see this blurb about a 2016 paper. ... about the biophysics of cholera, see this blurb about a 2018 paper. ... about our use of neural networks for image analysis, see this 2018 paper. Video: Light sheet fluorescence microscopy of Vibrio bacteria expressing green fluorescent protein, swimming in the intestine of a larval zebrafish. Our lab uses imaging-based approaches to study the gut microbiome, examining bacterial colonization, growth, and interactions. Our work on microbial communities is part of a NIH Center for Systems Biology, which brings together about a dozen groups in Biology, Physics, Computer Science, and Math all interested in the issue of host-microbe interactions. A press release for the center is here. We collaborate closely with the group of Karen Guillemin, and others. Cellular membranes are remarkable materials: flexible, two-dimensional fluids. Their flexibility is important to the control of shape, as membranes are pinched off into cargo packets, as organelles are formed within cells, and as cells themselves divide. Their fluidity is important to the ability of membrane proteins -- encoded by over a third of the genes in the human genome -- to move and associate with one another as they build structures and perform chemical reactions. The lipid bilayer forms the underlying architecture of all cellular membranes, and determines the membrane's physical properties. We perform experiments to quantify characteristics such as fluidity and rigidity, often developing new methods involving microscopy, micromanipulation, and particle tracking. Two-dimensional fluidity is one of the most important properties of biological membranes, as it allows lipids and proteins to interact with one another in spatially and temporally dynamic ways. Despite the importance of 2D mobility, its physical underpinnings are poorly understood, and 2D viscosity is not well quantified. We are exploring these topics using microrheological methods -- analyzing the Brownian motion of membrane-anchored particles and lipid domains. We've developed two new approaches to measuring membrane viscosity. One involves simultaneously examining the rotational and the translational diffusion of membrane-anchored colloidal particles (illustrated below). For a description, see this paper, or this short description. The other involves a method known as "two-point microrheology," in which correlations between the Brownian trajectories of objects in a membrane reveal the viscosity of the embedding membrane. See this paper for more information. Diffusion of a membrane-anchored tracer pair . Recently, we've measured how the mechanical tension of a membrane affects membrane fluidity. The three-dimensional analogue of this -- the pressure-viscosity relationship for liquids -- has been studied for over a century. 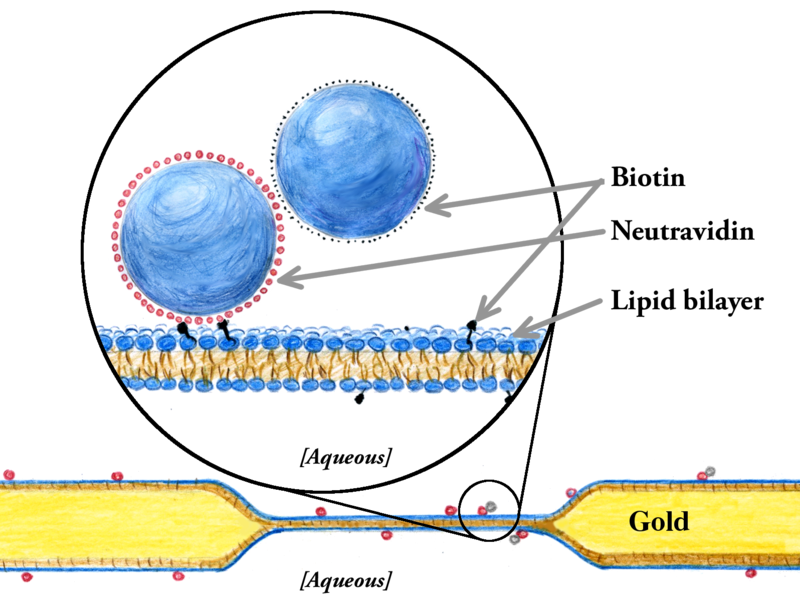 Ours, however, was the first study of this very fundamental relationship for lipid membranes! Surprisingly, we found membrane fluidity to be very insensitive to mechanical tension. See this paper for more information. The trafficking of cargo in cells involves dramatic transformations of membrane shape and topology by particular trafficking proteins. How do these proteins harness forces, energies, and local material properties to sculpt transport vesicles? How do proteins create curvature? Experiments in our lab seek to illuminate the mysterious mechanics of trafficking with experiments that directly construct, deform, and observe membranes interacting with trafficking proteins. We have found that Sar1, a protein that regulates vesicle trafficking from the endoplasmic reticulum, lowers the rigidity of the lipid bilayer membrane to which it binds -- by up to as much as 100% as a function of its concentration. This is the first demonstration that a vesicle trafficking protein lowers the rigidity of its target membrane. 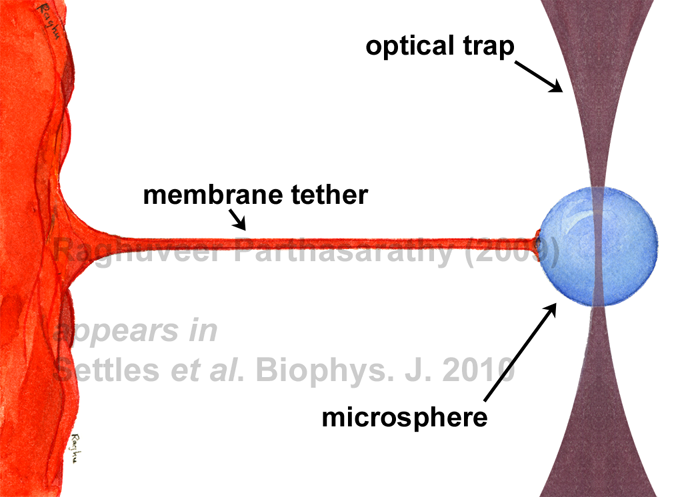 Our experiments, illustrated below, involve using optically trapped microspheres to create membrane tethers whose properties reveal membrane mechanical properties. Thermally driven shape fluctuations of a giant lipid vesicle, incubated with the vesicle trafficking protein Sar1. Analysis of the fluctuation spectrum reveals the rigidity of the membrane, which is dramatically lowered by Sar1. From Andrew F. Loftus, Sigrid Noreng, Vivian L. Hsieh, and Raghuveer Parthasarathy, "Robust Measurement of Membrane Bending Moduli Using Light Sheet Fluorescence Imaging of Vesicle Fluctuations," Langmuir 29: 14588--14594 (2013). 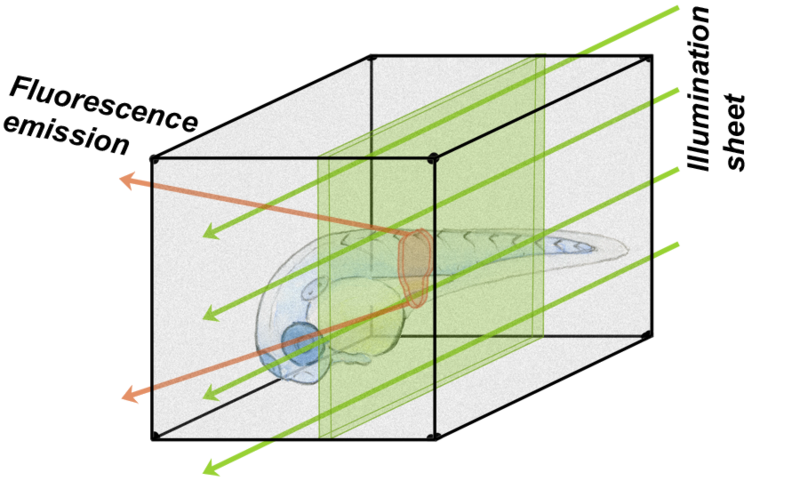 To explore the above-mentioned topics, we use and also develop a variety of advanced optical microscopy techniques. These include light sheet microscopy, interferometry, optical trapping, particle tracking, and other methods. For a description of some of the computational challenges associated with our bacterial imaging projects, see here. Since writing that, we've devoted even more efforts to machine learning for analyzing complex image data, especially using convolutional neural networks, which has turned out to be very interesting [paper]! A few years ago, we invented a new, fast, accurate, particle tracking method based on analytic determination of the radial-symmetry-center of a particle image. Please see our Particle Tracking page for the citation, software, and more. Illustration of particle tracking based on radial symmetry. (a) A simulated CCD image of a point source with shot noise, generated from the noise-free high-resolution simulated image shown in (b). The red X indicates the true center. (c) The gradient of the intensity (orange arrows) is calculated from the image in (a) at the midpoints between pixel centers. Circles indicate the pixel centers. Yellow lines are drawn through each midpoint, parallel to the gradient. (d) The point of minimal distance to the yellow lines in (c), indicated by the orange circle, provides an accurate, analytically calculable estimate of the particle center location. We gratefully acknowledge support from the National Science Foundation, the National Institutes of Health, the Research Corporation for Science Advancement, the Gordon and Betty Moore Foundation, the Simons Foundation, the M. J. Murdock Trust, and the Kavli Foundation.